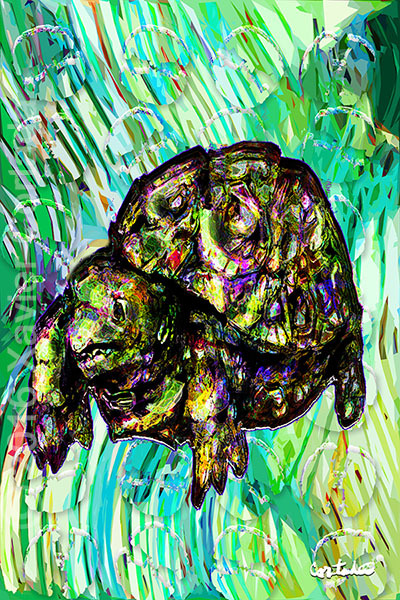 Xavier Cortada, “(Florida is…) Gopher tortoises,” archival ink on aluminum, 60″ x 40”, 2016. Gopher tortoises (Gopherus polyphemus) are ancient; their ancestors are a species of land tortoise that originated in western North America some 60 million years ago. A keystone species, it shares its burrow with more than 350 other species, including burrowing owls, Florida mice, indigo snakes, opossums, rabbits, gopher frog, eastern diamondback rattlesnakes and gopher crickets.